DeAndre Daniels scored 27 points and the Huskies shot 52 percent from the field to hold off the Cyclones in the NCAA tournament East regional semifinals in New York. 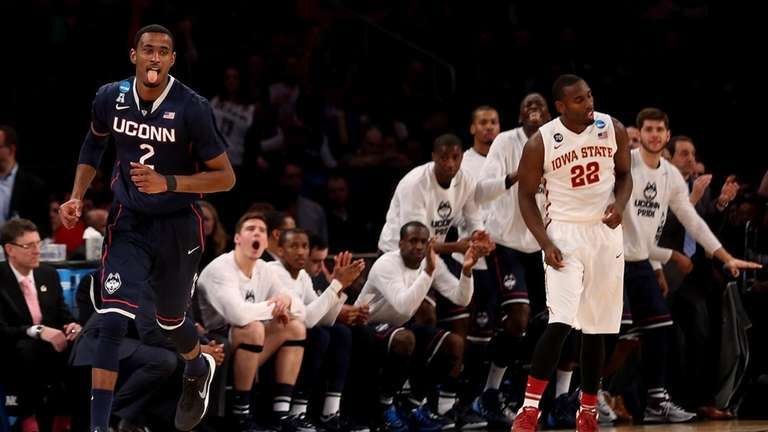 UCONN beat Iowa State 81-76. Daniels hit 10-of-15 shots and Shabazz Napier added four 3-pointers en route to 19 points for seventh-seed Connecticut (29-8), which plays fourth-seed Michigan State in the Elite Eight on Sunday. The Huskies led by 17 points with a little more than 14 minutes remaining and withstood a late rally by Iowa State (28-8) by hitting 11-of-12 free throws in the final 47 seconds. Dustin Hogue led the third-seed Cyclones with a career-high 34 points on 15-of-19 shooting from the field, but Iowa State leading scorer Melvin Ejim struggled through a miserable night from the field, finishing with seven points on 3-of-13 shooting. Iowa State shot just 6-for-15 from the free throw line. Daniels’ 3-pointer staked Connecticut to a 49-32 advantage early in the second half, but the Cyclones rallied with a 24-14 spurt – 21 of the points coming from Hogue and Kane – to draw within 63-56 on Kane’s 3-pointer with 4:40 to play. Iowa State pulled within 67-63 on Naz Long’s 3-pointer from the right corner with 2:18 remaining, but Niels Giffey answered with a 3-pointer on Connecticut’s ensuing possession. The Huskies shot 51.9 percent from the field in the first half, hitting 7-of-12 3-point attempts, in building a 36-26 advantage at intermission. Daniels scored 11 of Connecticut’s first 13 second-half points as the Huskies pushed their lead to 17 points.